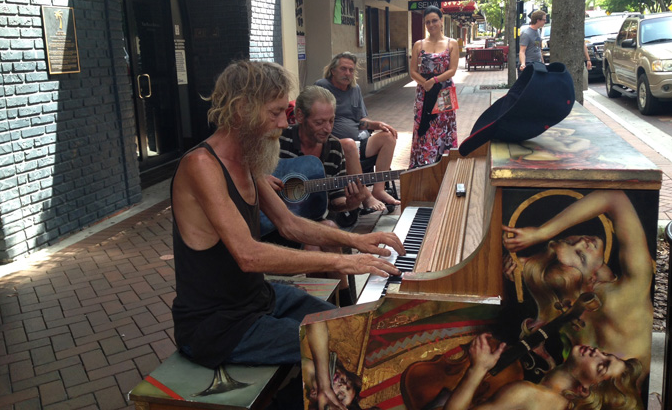 Donald Gould has become a viral sensation after footage of him playing a piano on the streets hit the internet. The homeless musician was just trying to make some money with his talent on the streets in Sarasota, Florida, to be able to buy food. The 51-year-old former US Marine claims to have once travelled the world playing in a symphonic band, attended and dropped out of Spring Arbor University doing a music degree, and was once married and had a child. He also claims he can play every instrument from the piccolo to the tuba. Tragically, his wife died in 1998 and he spiralled into depression, lost his job, the custody of his son, and has now been homeless for six years. I sleep under the stars every night, unless it’s raining. I was thinking I could just put my hat on the piano and make a couple dollars and get tips. I didn’t expect it to jump out to this. Amazingly, he has now been offered a job in a piano bar and there has been a CrowdFunding page set up to help him raise cash to complete his music degree.